← WDTPRS: 5th Sunday after Epiphany AND 5th Ordinary Sunday: Familial military or martial family? Gerhald Ludwig Card. Müller, former Prefect of the CDF, has issued a “Manifesto of Faith”. It has a title reference of “Let not your heart be troubled!” (John 14:1). You can get the text HERE. The idea clearly is that many hearts are, in fact, troubled. Müller clearly explains many points of the Catholic Faith which are weakening, or being weakened, through neglect and through the irresponsibility of the Church’s clergy. I’ll read the Manifesto. There are so many references to the CCC that I don’t include them in the reading. You would do very well to go through it with a copy of the CCC at hand, to check on the paragraphs and their own footnotes and references. I also rant before and after. I make a case that the content of the Faith is truly a Person. 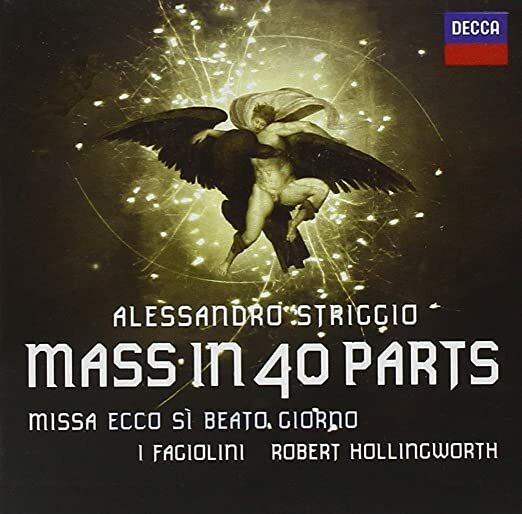 Just for fun, and in honor of a certain person, you hear some of the Credo from Striggio’s Mass for Forty Voices – yes, 40. It is performed by I Fagiolini (“the string beans”). Let’s just say that before Phil Spector and the “wall of sound” there was this! This entry was posted in ¡Hagan lío!, "How To..." - Practical Notes, Four Last Things, GO TO CONFESSION, Hard-Identity Catholicism, Mail from priests, New Evangelization, Our Catholic Identity, PODCAzT, Si vis pacem para bellum!, The Coming Storm, The Drill, The future and our choices, Wherein Fr. Z Rants and tagged Faith, fides qua creditur, fides quae creditur, Gerhard Ludwig Müller. Bookmark the permalink. God bless the priests, bishops, and cardinals who defend the faith. The flock needs your protection. Striggio’s “Ecce beatam lucem” (on this album) was the inspiration for Tallis’s better known “Spem in alium”. Thanks for the music link; I enjoyed the sample video on Amazon and had to laugh when the final credit showed that the filming took place at All Saints Tooting—perhaps they had too much “fagioli”?! This is quite good. Thank you Fr. Z for posting this and creating a recording of yourself reading the text. The statement that the Card. opens with “Today, many Christians are no longer even aware of the basic teachings of the Faith, so there is a growing danger of missing the path to eternal life.” needs to be stressed. Part of this document is addressed to Catholics, but the beginning also is addressed to Christians who are not part of the Church. Those who are our brothers by baptism but are outside of Mother Church are very often doubly unaware of the basic teachings of Christianity because their own pastors do not teach it and are also unaware because, being taught not or taught false concepts, they also do not encounter the basic teachings of the Faith from those Catholic pastors who have opportunity, obligation, and or platform to teach do not do so. The widespread abandonment of teaching basic concepts of the Faith to the point that individuals have a real and present “danger of missing the path to eternal life” that this letter from the Card. must be faced and not turned away from in chagrin. How many readers of this blog could name a parish within easy driving distance where they would hear the exact opposite of the letter preached from the pulpit? Where does this fraud come from? All fraud is rooted in a truth for the devil cannot create, but only twisted. It is rooted in what Fr. Z said and stressed at the end of his podcast — that the person of Christ cannot be reduced to formula and doctrine. Those that promote the fraud believe strongly in this. The twist of the devil that allows the fraud to grow is that, in believing that the person of Christ cannot be reduced, they reject a congruency between formula/doctrine and the person of Christ. Further still, this also applies to the moral law and is why such promoters of this fraud believe that the moral law can be trumped and done away with. This is what the Card. is speaking against when he says, “The moral law is not a burden…” for those that promote the fraud seek to replace the moral law with a false mercy in the name of an incorrect understanding of the dignity of the human person achieved through accompaniment of the other. True mercy is what the Card. states, “God’s mercy is given to us, that we might fulfill His Commandments to become one with His Holy will, and not so as to avoid the call to repentance,” and, “To point this out corresponds to the spiritual works of mercy”. A lifetime of wall-to-wall postconciliar bafflegab had crushed my hope of ever living to see a day like this. Nunc dimittis! Seems to me that Massimo worships the Pope, this Pope that is. Thanks you, Father, for making this available. I’m sharing it liberally. God bless you and your good work. This, and the essay of Bp. Athanasius Schneider which you posted earlier, has done much to soothe this troubled spirit. Thank you for your tireless efforts. I pray God I, and all the Faithful, will have the strength and Faith to cling to what I have been given. At last, Cardinal Müller frankly and openly decided to cross the Rubicon of the necessary correction of Pope Francis’ heresies. Thanks God and congratulations, though I would have preferred him to issue it when he still was Prefect of the CDF. A hard week is in sight for the Pope, after the last dubia letter on homosexuality, the correction by Mgr Schneider about the “diversity of religions is the will of God”, and Card Müller’s Manifesto. These are not mere “coincidences” but certainly the Will of the Holy Spirit answering our prayers. I wonder which will be the Pope’s reaction: Anger ? or acknowledgement of his mistakes and profession of humbleness?